Today sees the start of the final challenge of the year for Crafty Boots Challenges, the theme of this challenge is 'Winter Wonderland'. I have lost count of the number of Design Team projects I have made this year but this is my one for today. I coloured this image some time ago and mounted it on the polka dot paper but then I did nothing more with it, so today I have turned it into a Christmas card for a good friend. I am sure there is a term for this but I cannot think what it is. 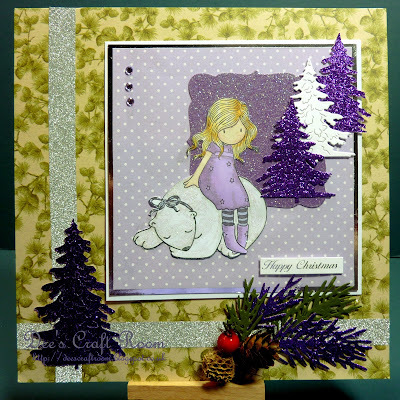 The stamp is a Gorgeous Girl one called Winter Friend, I coloured it with Promarkers. The polka dot paper is from Dovecraft, the evergreen paper is from First Edition (this paper really isn't this acidic in real life). The pine branch die is a Marianne Creatable die but I am not sure of the make of the trees, it is a new one and all the pack says is 'made in China'. The sentiment is from Anita's, everything else is from my stash. The rest of the Crafty Boots Design Team have been busy, please pop over to the blog and take a look at their fabulous work for yourself. Welcome back, I have really missed your visits. Thank you for your lovely comments. I love this card! Great colors and love the glitter! I like how you used white and purple trees and that image is so nice. Thank you, I have a thing for glitter and as for purple, emmm.